This is not a sales pitch but rather a test market to see how kids respond to the book. Happy Tonics exhibited with Fresh Start, at Family Festival in Spooner, WI, on June 2. 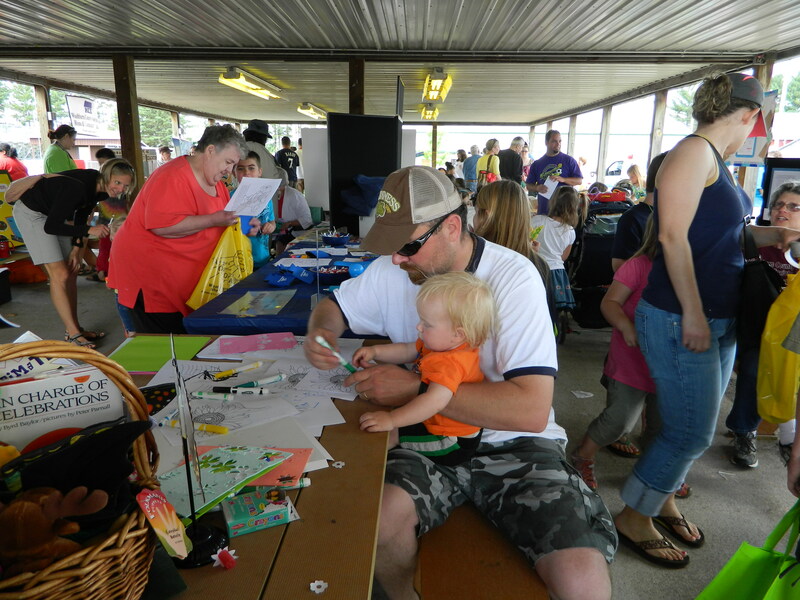 Dan Gunderson, Fresh Start, made copies of the coloring book pages and children stopped by to color. I got a kick out of seeing a father coloring for his baby, so sweet. Hundreds of families, grandparents, and children came. I even saw a few of my friends, on their walkers, from Terraceview Living Center, a nursing home in Shell Lake. One reminded me to bring over a few butterfly plants for the outdoor garden. They want to have a butterfly garden. What a grand occasion it was for community and the butterflies. I became a children’s author quite accidently, perhaps by serendipity. I have a passion and great love for the natural world in which I live. An Ojibwe elder, Margaret Lynk (Soaring Woman) once told me, “Let nature teach you.” I never forgot that lesson. I am an environmental educator and executive director of Happy Tonics, Inc., a nonprofit, 501 (c) (3) environmental education organization and public charity. Children need to learn from nature. Hopefully they will feel a passion for the natural world throughout their lives. One day, in the not so distant future, children will inherit the Earth from us. Hopefully some will become future stewards of the land. Nature can exist without the human species, but humans cannot survive without nature. Robert Louv, author of Last Child in the Woods, addresses this critical fact in his book. 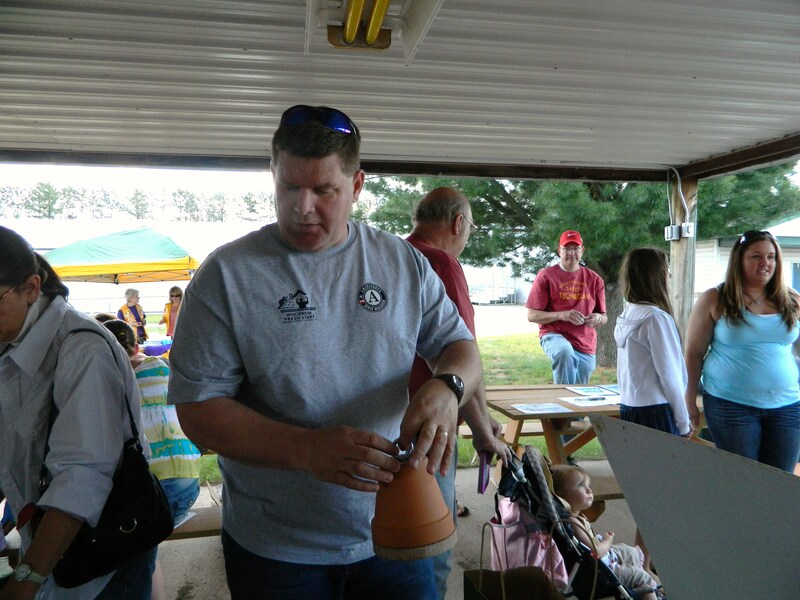 He believes children and many adults have nature deficit disorder. Each of us is given gifts. I was given a great love for nature. I want to share my life’s work and expertise with the younger generation. I want to teach children about the beautiful natural world on this planet, which we call home. How did you come up with the idea for your first book, My Name is Butterfly? Back in 2003, I witnessed a monarch caterpillar in my garden. Each day, I would go to the garden to check on the monarch’s life cycle. I was in the garden when the adult monarch butterfly emerged. I spent the first three hours, of the monarch’s life, taking notes and photographing the experience. 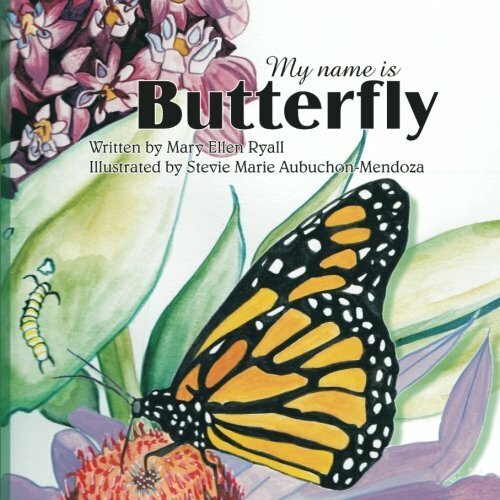 I even wrote, “What is this butterfly trying to teach me?” In 2006, I wrote the story of a young girl in her garden who learns about monarch biology from a butterfly. One can read the story behind the book. Frank Zufall, reporter, Spooner Advocate, wrote an article, “This county story begins under a plant,” at www.spooneradvocate.com. How long did it take to get My Name is Butterfly published? In the summer of 2008, I hired several youth through a grant from Concentrated Employment Program. It just so happened that I had unwittingly hired a publisher’s granddaughter. I told India Casey that I had written a children’s story about the monarch butterfly. Happy Tonics had implemented a native restored remnant tallgrass prairie, which is a Monarch Butterfly Habitat, on city land in Shell Lake, Wisconsin. India told her grandmother about the story. A few days later Lindy Casey, owner of Salt of the Earth Press, came to the office. She read the story and said, “This is important. I am going to publish it.” It took from 2008 until 2011 to get the book published. The reason it took so long was that the publishing house burned down. The publisher had to resurrect the business from the ashes. I don’t know the title, and I wish I did. It was a story about an elder, a grandmother- type person. The grandmother had a house that was on the way to school. The grandmother made chocolate candy. The young child, in the book, would stop at the elder’s house on her way home from school. She would open the white picket fence gate. Hollyhock flowers grew along the fence row. The child would walk up to the house. The immaculate white house felt secure and safe to the child. She would visit the grandmother and have a piece of candy before she walked the rest of the way home. I think it is important to know why a certain children’s book is special to a writer. Children’s books often help youngsters cope with difficult situations. Many children grow up in dysfunctional homes. In the story, a child needed to feel safe. How wonderful that a child could feel love, in the tidy white house, where a grandmother lived. I hope that children will become curious about nature and want to learn more about butterflies. The book teaches about one pollinator and what the insect needs to survive. Without native host and nectar plants, there would be no butterflies or other pollinating insects, diverse crops, or plant pollination. Environmental education needs to be taught, in grade school, in the United States. Published author, Eva Apelqvist, originally for Sweden, informed me that Europe taught environmental education starting in the lower grades. No wonder many American youth of today have Native Deficit Disorder. Children’s authors don’t always get to choose who illustrates their books. Are you happy with how your illustrations turned out? Are the characters as you imagined them? The characters in the book are based on reality. I chose Tanya and her daughter Cassandra (Cassie) Thompson to model for the story. Cassie attends Northwood School in Minong, Wisconsin. Cassie has been a monarch butterfly advocate since she was a youngster. 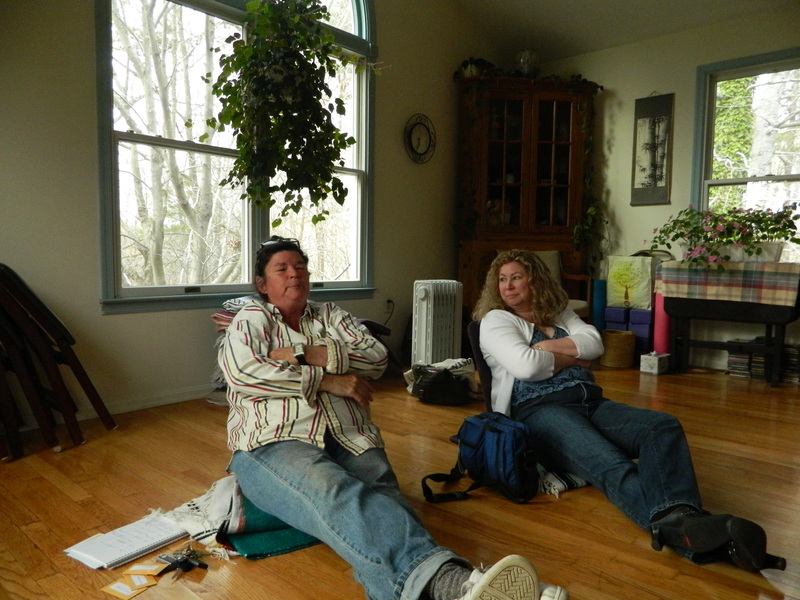 The publisher requested that I have models act out parts in the story. I photographed the story while Tanya and Cassie acted out the parts. Photographs of a monarch butterfly life cycle, and photographs of the story models were sent to the publisher. Then illustrator and artist, Stevie Marie Aubuchon-Mendoza, Las Vegas, Nevada, was commissioned to do the illustrations. Stevie Marie did a fantastic job. At the time she was pregnant with her first child. By the time Stevie Marie finished illustrating the book, her baby daughter was sleeping in her own room. The illustrator told me that the butterfly would always be with her and Olive, her child. The monarch butterfly teaches us about transformation. Yes. 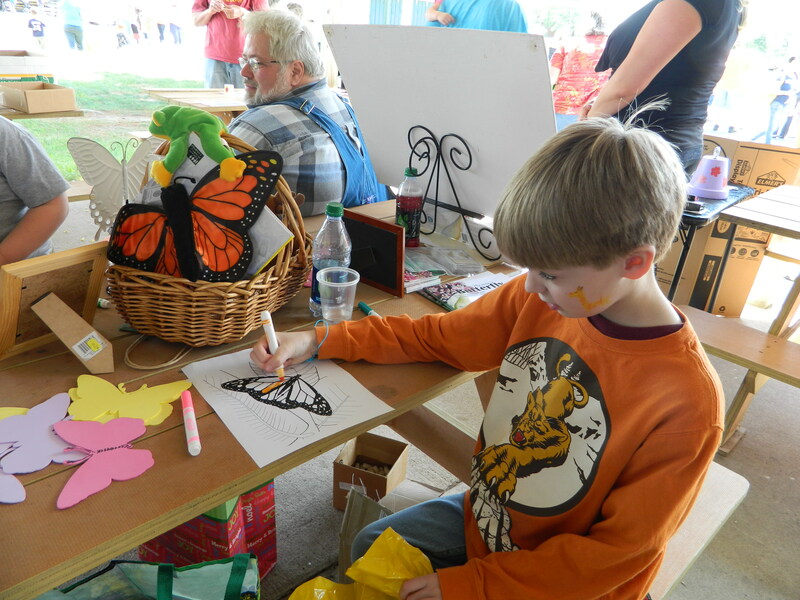 Monarch Butterfly Coloring Book is about ready to be published. I am waiting for the graphic designer’s cover. Cindy Dyer, of Alexandria, Virginia, is the owner of Dyer Design at http://cindydyer.wordpress.com. I chose an artist, Mora McCusker, of Gordon, Wisconsin, to illustrate the book. Mora used my photographs to illustrate the coloring book. The project is a teaching book. 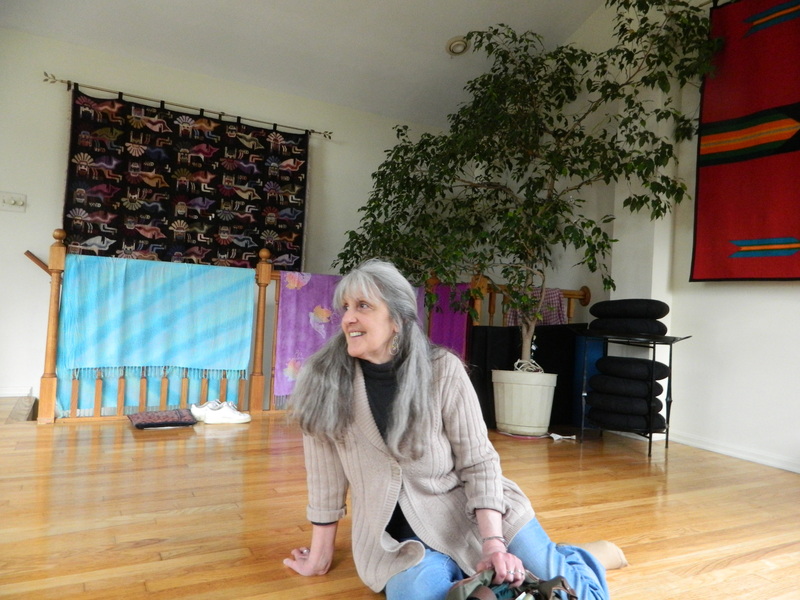 Cindy Dyer is responsible for the art, page layout, and cover. We are jointly publishing the book on CreateSpace, a book publishing company, owned by Amazon. At present, I am writing a Field Guide for the Monarch Butterfly Habitat, Shell Lake, Wisconsin. The guide will illustrate the symbiotic relationship between pollinators, native host, and nectar plants. Invasive species as host plants cannot support pollinators. The goal of the book is to teach that native plants are necessary for pollinating insects. The finished book will be published by Butterfly Woman Publishing. Hopefully writers and visitors to your Website at www.beachboundbooks.com will enjoy staying in touch via our Blogs and Social Network Sites, such as Twitter and Facebook. I believe writers and anyone connected to the publishing world will have more success when we work together. It is in working together that we can show our work to the world. Bless each and every one of us. It is all about seeing beyond ourselves. You can read a sample of My Name is Butterfly at www.amazon.com. You can also find her on Twitter (@happytonics) and on Facebook. Lynda Ireland, Marketing and Events volunteer has sent out 101 post cards, to businesses and schools in St. Mary’s and Calvert County, recommending that they purchase a copy of My Name is Butterfly. At present we have no way of tracking a cost benefit analysis. The only thing I can suggest to the publisher, Salt of the Earth Press, is to track sales on Amazon. If book is being shipped to So. MD then perhaps we will be able to track sales and know if this marketing technique is worth the cost. If you are an author, illustrator, graphic artist or publisher do you have any suggestions as to how to market a Children’s illustrated book? The charming book is about a girl in her garden who discovers a monarch butterfly chrysalis and learns about the life cycle of the monarch butterfly. At present, the author is advertising and marketing on Facebook, education and environment categories. Let’s put our heads together and launch a buzzing conversation that may help other authors also.